Is she black-presenting? If so, yes. Hey Ree, have you ever read ‘Molten Chocolate’. It’s available on wattpad. And trust me, the title speaks for itself. The main characters are black and bi-racial. It’s my own work and I’ll love for you and others to check it out if you haven’t already. I’m a black woman also. Neilani Augustus is a princess of the Luxavian tribe, regarded highly among the other seven tribes of the Nonia Empire. Or at least she was. One mans error led to the end of all that, both her tribe and her were exiled from the Nonia Empire and all their practices deemed illegal. But there is much more to the downfall of her tribe than she knows, more things that are to be revealed. Forced into hiding she struggles to find out her next steps. Will she ultimately lose herself in a quest to discover her true power? But there is true light burning within her and her people and the light fights to be seen. And she will soon come to realize that she is not alone in the quest to restore her people’s honor. I’m writing a book about a magical dark skinned girl with epic powers who falls for a dragon king, dang I wish it was ready! I’m still waiting on the cover. Tagging this so I remember to come back to this thread when it’s ready to go! Hi, I’ve written several stories that feature black characters as leads in different genres. They are a mixture of YA, paranormal, urban fiction, NA, & mystery/thriller. Some are mature and others aren’t. While living in “The Horizon” is challenging enough, Kierra Jackson has a hard time believing that the sleepy small town in Arkansas could become the number one zombie-beast destination of the world! It all starts at the high school, McCrystal Falls when Kierra stumbles upon a string of strange events. After witnessing an odd sight in the woods, a face from hell scaring her to death, and receiving ugly phone and cyberspace threats, she knows something bad is about to happen. She has a difficult time convincing her boyfriend Brent to help her figure out what’s going on. But in the end, she finally breaks through to him. It’s not too long before the pair realizes that a horrifying virus that destroys flesh on contact and turns its victims into hideous zombies-beasts has been let loose on campus. They become even more mystified when an unstable teacher at the school is helping outcast students to create the mysterious virus to get back at an obnoxious crowd. Kierra and Brent discover that “The Horizon” is only a pawn in a scheme to take over the entire world. The zombies-beasts decides to transform the citizens into the living dead so they can help turn every town into a ghost town. The only question remains is: What can two teenagers do to prevent the massacre from taking place? Kierra began to expect that there’s a possibility the town will never be the same again. In 1958 Saint Louis, Vivian Edwards saw her mother die of a drug overdose when she was a child. Although Vivian’s mother was around, she neglected her. She never knew her father; he ran off before she was born. She didn’t have anybody except the elderly couple next door that took her in and raised her as their own. As a teenager, Vivian promised her surrogate parents that she would never fall prey to the streets. By 1987, Vivian had already been married for seventeen years to a hustler name Calvin and they have three children together. The neighborhood they live in is a wild inner city hood, where nobody belongs. A place where Vivian and Calvin is all too familiar with. As Vivian struggles to take care of her family, she sees herself breaking her promise. She and Calvin become the prey and the predator that haunts the streets at night. Their children are growing up around drugs, poverty, gangs, violence, and death. Sometimes it makes Vivian wonder if they ever would make it out of their hood alive. Waxahachie, Texas, 1970: a woman brutally murders her cheating husband, his mistress, and her two kids, before killing herself. Flash forward to the 1990s. A new family moves into the murder house. Paula Harris is determined to start a new life with her family in Waxahachie. The realtor and neighbors warn Paula and her husband of the tragedy and rumored hauntings, but they write off the stories as small-town gossip and move in any way. Weeks later, evil spirits torment them. It starts with voices, footsteps, shadows, and progresses to apparitions of the murder victims. During the day, the home sits quiet and peaceful, but at night the evil spirits possess one of Paula’s children. The family is horrified when the evil spirits try to kill them. The matriarch of the spirit family transports Paula to 1970 to witness the long-ago murders. Through painstaking research, Paula learns that every family who has ever lived in the home has either fled in terror or mysteriously disappeared. Unable to leave because the evil spirits attached themselves to her family, Paula desperately tries to destroy them and rid the house of their presence. She knows that if she fails, her family will die. After committing a murder with her friends, Andrea’s only now regretting it. The others don’t feel guilty, and they all agree that the crime would never be solved, so they put it all behind them but not for long. A stranger from cyberspace reaches out to Andrea, and her nightmare escalates. A shooting attempt on her life gives credence to the death threats. After two of her accomplices turn up dead, she realizes that a killer is intent on picking them off one by one. Whoever it is that has their sights on them has to be close to her, because they know way too many personal aspects of her life. She has to make a choice: Kill or be killed, but first she has to identify her target. Janette ‘Jana’ Andrews and Damien ‘Nicky’ Coleman are police detectives solving crimes in the heart of present-day Little Rock, Arkansas. The detectives are looking for a serial killer that has a thing for pretty teenage girls. The killer “The Striker” stalks poor (East side) and affluent girls (West side) in different parts of the state. They have been looking for him for over three years now. Can the detectives catch this killer and prevent his next crime spree? He would you be interested in my stories! I have this one whether the MC is black but in the first book she’s incarnated to a different race. The focus is not real about race, though I’m Black I just made it her incarnation is different from her original self. Well me, i read any book that captures me no matter who the authors. I read book from black writers, indian, Americans and Europeans. Writing has no color. Its all art. And i learn a lot from their style. Just saying my side. I didn’t ask for your side, though, lmao. I asked for books written by black women and about black women, and I don’t need to justify why I did so to you. Hi, is the start of my novel if you want to check it out. For as long as sixteen-year-old Crystal can remember, she has been trapped in the house by the person that should have loved her the most; her mother. When she stumbles a secret, her whole world begins to unravel, and life starts to get real interesting. With the help of a beautiful stranger, she must keep herself alive and find out the deadly secrets of her past and present. Will the truth finally set Crystal free or make her feel more trapped than ever? A story of mystery, action, hope, tragedy romance and fantasy. None at the moment, I only have a poetry book out at the moment. But I have loads of books with black female MC’s as well as other WOC MC’s. I’ve created the covers and mapped out the central plot, but I don’t know, writing it isn’t easy. The ideas just aren’t flowing as easily. Alrighty. You’re the boss ma’am. Though i dont write it to offend. More like explaining/sharing. Because they said wp is a friendly community. My story is sort of new. It’s written by me, a black female, and has a black female main character, in fact most of the characters are POC. All my stories Sapphire Flame , Diamonds & Rubies , and Being A Boxer’s Woman have black female leads. They all also feature BWWM relationships. 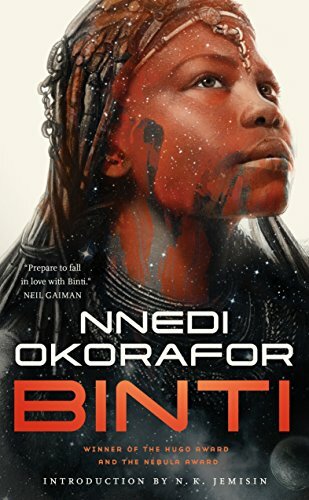 Have you read the Binti series by Nnedi Okorafor?